The evening promises to be an electrifying night as Maysa headlines this phenomenal line up and graces the elegant stage at The Music Center At Strathmore with her classically trained, jazz infused style of soulful vocals. As a special guest Los Angeles-based singer/songwriter/producer Gary Taylor will join Maysa on November 30th. Taylor is most known for speaking to the hearts of women and men regarding love, romance and the almighty relationship thru his thoughtful, intelligent and impassioned soul music. To round out the line up Fertile Ground, another Maryland favorite, will also join Maysa as special guests for the evening. Fertile Ground is often classified as a soul/jazz band but they spill out of any genre as a cross-cultural fusion of all things spiritual and funk-ridden. Nov. 28 Strictly Social w/Peter Hadar, Jon Bibbs, Jimmie Reign. RSVP now! I hope everyone had a wonderful holiday weekend. Now it’s time to get back to business! This Wednesday is another editor of Nu-Soul’s signature event, Strictly Social. As a special bonus anyone who RSVP’s on Going.com for the event gets a chance to win the new album from Amp Fiddler, Afro Strut. This will be our biggest lineup yet so please come out and support the sounds of Peter Hadar, Jon Bibbs, and Jimmie Reign! For this event and more check out the site. Nu-soul Magazine presents another edition of Strictly Social on Wednesday November 28. Join us for a night of eclectic soul fusion at the beautiful Skinny’s Lounge in North Hollywood. Come early for a special listening party for Amp Fiddler’s new album Afro Strut! *PERFORMANCES BEGIN PROMPTLY AT 11PM SO GET THERE EARLY! Nu-Soul bridges the gap between the world of R&B/soul and the underground vibes of electronica, the common factor being a grounding in funk, soul and urban lifestyle. This is a place where the sounds of neo-soul, drum and bass, deep house and breakbeat are a part of the same family. Through fascinating articles, engaging interviews, and the latest reviews, Nu-Soul hopes to open minds to the incredible array of soul influenced music available today. Hello to all my Soulful Friends! In other news, I wanted to take a moment to give congratulations to a couple of very talented friends. First off, Ragan Whiteside has released her CD, “Class Axe.” She had her standing room only CD release party last week at the Village Underground. If you haven’t yet had a chance to check out her music, go to her website at http://www.raganwhiteside.com. Secondly, bassist and vocalist, Miriam Sullivan, is busy working on her debut CD release as a leader. The work will feature her original music. She also has a new website where you can read more about what she’s been up to. Visit the website at: http://www.miriamsullivan.com. Thanks, as always, for your love, support and encouragement. It keeps me going especially when times get hard. I appreciate each and every one of you and give thanks constantly for your presence in my life. Thanks for being always there. i just recently found out that CD Baby has a list of its top sellers in each genre of music. Apparently, Always There is listed under the Jazz category in the Soul/Jazz category at #8. Not bad, considering how many thousands of independent artists are selling their CDs there. So, In celebration of this, we’re offering the CD for a limited time only at a reduced price of $7.99 ($ 5.99 to download.) Please note that the reduced price won’t show on the “sellers list” but just click on the “Always There” cd cover and you’ll be brought to my page where the corrected special price is listed. Happy Holidays! 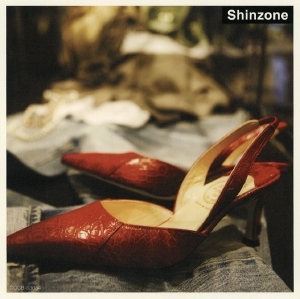 Shinzone, a well-known Japanese designer label has several boutiques which are very popular in Japan. Recently, Shinzone collaborated with Columbia Music Entertainment in the release of a CD compilation to sell in their stores. The idea was to feature some of Columbia’s artists in the stores, thus helping to bring increased exposure to each artists’ individual CDs on the Columbia label. The CD was released this past June. My recording of Light My Fire was chosen as one of the tracks. Other artists featured on the compilation are: Zonke, Culture Clan and Inger Marie. This coming Wednesday, November 28, we’ll be playing at the Cornelia St. Cafe (29 Cornelia St., NYC) in the village. Some of you may remember this place as it’s where we did our “Bon Voyage” show last year, prior to leaving for our tour of China/Asia. We’ll be sharing the bill with vocalist, Sarah DeLeo, who will go on at 8:30 pm. We’ll follow with a set at 9:30 pm. This show is part of a monthly series being presented by Jon Sobel and Soul of the Blues. You can check out both bands for one low cover price of $10. You can get more information about the Cornelia St. Cafe at: http://www.corneliastreetcafe.com. Check here for more upcoming shows! FREE! Download “Can’t Stop” Ringtone to Your Cellphone! For a limited time only, we’re offering a FREE ringtone of “Can’t Stop (Thinking About You)” for your cellphone. Click on the link here and Myxertones.com will instruct you on how to get yours now! Get your free “Can’t Stop” ringtone now! Soulful Sound Music is an independent company formed and operated by yours truly, Mala Waldron. We’re on a shoestring budget at the moment and making the most of word-of-mouth marketing. This means the more you spread the word about the new music, our performances and this newsletter, the more publicity gets generated, hopefully resulting in CD sales. At least that’s how it works theoretically folks. Las Vegas, Nevada November 15, 2007 – Unified Tribe’s Funktional Family CD continues to capture listeners all over the globe. The Bold and the Beautiful will air their second single, Happy Go Lucky on Friday, November 16, 2007. Happy Go Lucky is the follow-up to their chart topping single Back n’ Forth. Both jocks and listeners are digging the upbeat, mood transforming sounds of the track. More than 350 retail outlets have picked up the album FUNKtional Family, with coverage growing weekly. Retail support includes in-store play, listening booths, and prominent placement. “Every member of this group is talented to the point of perfection. The vocals & instruments were so tight and yet smooth, my attention was captured throughout the CD,” states Selekto Steve of Select-O-Hits Distribution. Becoming one of UK’s mega soul bands Unified Tribe’s FUNKtional Family has made a major stir abroad. The album is receiving airplay on BBC Radio1 and that station’s Trevor Nelson says it all with, “This album is mental!” The Album has hit number one on the three largest independent charts in the UK – the Blues & Soul Hiplist, Street Soul Chart, and Solar Radio Sweet Rhythms Chart – the only record of 2006, of any genre, to top all three charts. Blues & Soul Magazine says it is “arguably the hottest soul/R&B album around, with heavy airplay from the UK’s leading soul DJs. A must for lovers of the soulful groove.” Additionally, FUNKtional Family has outsold all other import soul releases of the season. At home, both in the studio and on stage, the Tribe’s originality comes across in any setting. Fans and industry aficionados alike often comment on the live show far surpassing any expectations. Unified Tribe, a micro-cosm of what the world could be. Alison Crockett in Detroit/Radio Airplay for Bare! if you know any others where my music is being played, let me know! Motor City here I come! 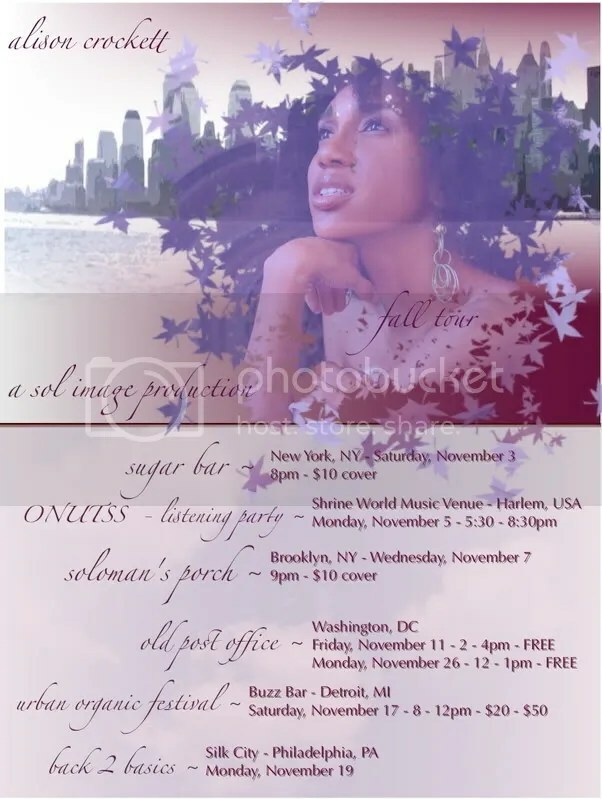 I’ll be there with two, count’em, two shows in Detroit, sponsored by Urban Organic Soul! Also, radio: independant, internet, and mainstream, is starting to come around. Rafe at the TheGrooveBoutique.com (a nationally syndicated show) will be playing Isn’t She Lovely this Saturday between 9:30 and 10:00pm! See below for where you can check it out! Check out now where you can download and purchase Bare! Christmas is coming, and don’t you want all your friends in on the secret of this record?! Click Here to purchase the record and find out what you think. Then email me back with your comments….I’d luv to hear from you!